There are a lot of options when it comes to energy drinks. With the laundry list of questionable ingredients in them, those following a real food lifestyle don’t have any choices. Then along came a conversation with Dave Self and Functional Therapy CA, who shared their recipe for a natural energy drink. 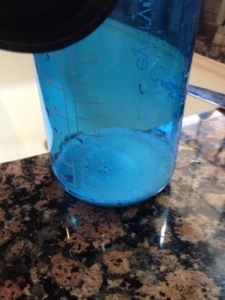 The baking soda makes the water alkaline, making it easily absorbed. The ACV detoxifies and alkalinizes the body and the lime provides vitamin C, flavor and alkalinizes the body also. 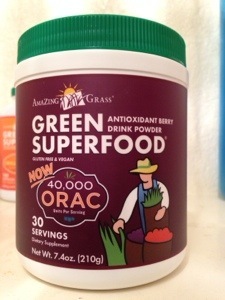 The body functions better in an alkaline state. When you drink purified water (tap, Dasani, etc), it is slightly acidic. 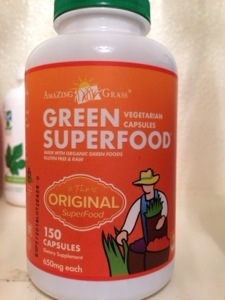 To absorb it in the body, it requires minerals. Without minerals in the water, they are leeched out of your bones. Otherwise, any water is just peed out of your system. The other option is to drink spring water (we like Mountain Valley, Fiji and Evian on the go and get home delivery for everyday drinking). 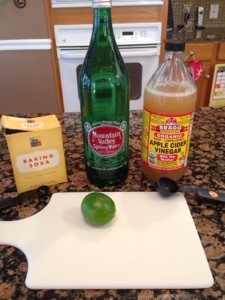 First, mix the apple cider vinegar and baking soda in a liter container. Watch the fizz bubble! 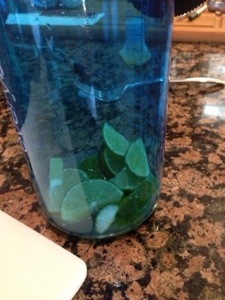 Cut a lime into slices and add to your container. 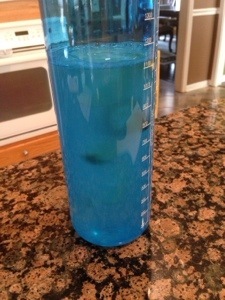 Fill with water and shake shake shake!